What are you most satisfied with, or proud of? Niek: I think what I’m the most proud of is the fact that I actually managed to get somewhere. With Ideas, before we announce something like this, we have to make sure we can actually do it. With other products you can pull out at the last minute and decide not to produce it, but we announced this product more than a year ago. That’s a very long time in advance. So we can’t just announce it, especially when it’s a fan submission, and then drop it last-minute. A large part of my initial involvement in this project back in 2015 was together with Sam Johnson, my boss, the creative lead on LEGO Ideas, who kind of roped me into doing this, because I love giant robots, it’s my favourite thing. So for me, making it into a form where everybody in the company is confident enough to sign off on it was a very big deal. As far as specific detailing goes, I like the shoulder joint, because it’s a very big part of that, and I like the design of the lion heads as they turned out. I think they’re very striking. "If I had hung on to the desire of giving the model knees, this set would not have happened. It’s basically that simple." Are there any parts of the design that you’re apprehensive about, when it comes to what kind of a response you think you might get? Niek: This is very much leading into the subject of articulation, which is something that is very important for mechs. I build mechs in my spare time, so I understand this entirely. And that is why, as a designer, I found this project personally both very important for me, but also very taxing to work on. I spent more than a year making it into what it is today. Normally, Ideas projects go through a much shorter refining process. So I realise there will probably be a lot of criticism about the lack of hip articulation, and in the legs in general, but I am personally happy to be able to settle with the fact that we’ve actually made this into a product. If I had hung on to the desire of giving the model knees, this set would not have happened. It’s basically that simple. 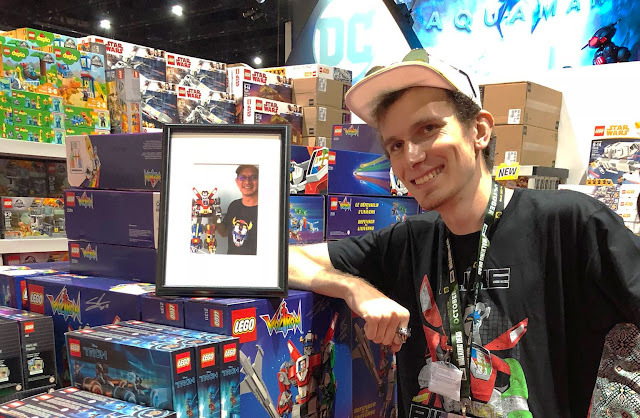 Our quality department is very, very dedicated to making sure that every product we put out has and upholds this LEGO standard that people have become used to, and we really don’t want to push out something that we don’t feel entirely confident with. I’ve had extensive meetings with both them and the engineering department to make sure that the elements that are load-bearing have very tight tolerances, so that if something goes wrong within production, the model will still be able to hold up – that kind of stuff. So I completely understand the inevitable feedback I will be getting about lack of articulation, and I will take it to heart, because I know that’s the kind of thing people are excited about – but I’ll answer you with this: It does have shoulder articulation. Which I’m very proud of. It has shoulder articulation, and it has wrist articulation. I think what’s very important to realise is that with a model this size, there’s over 1.5 kilos of LEGO resting on his two big feet, so having knee joints is something that we cannot guarantee the quality standard with. 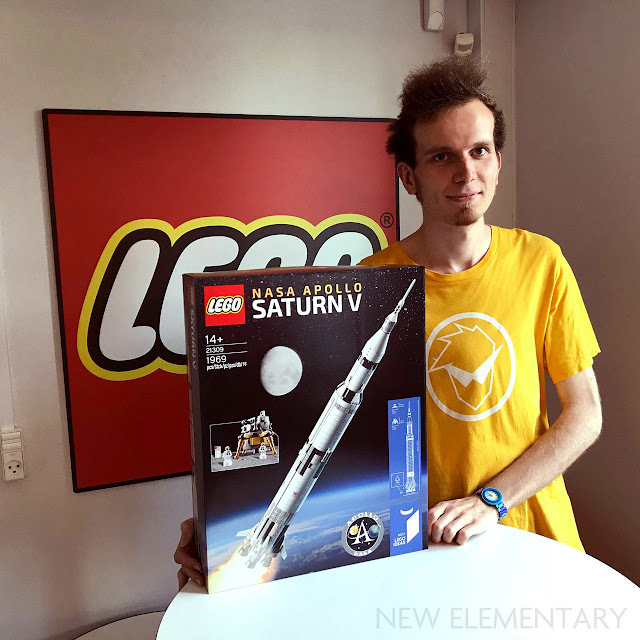 When you see it standing, it’s an unusual way for a LEGO product to look. Its feet are slanted. Niek: Yes. A lot of the initial concept models were standing up straight, because we couldn’t get a joint in the hip that would move outwards and be strong enough. The Fire Mech from the Ninjago Movie has three ratchet joints, which is a great solution, but this model weighs almost twice as much. In my initial versions, that was present, and then we had to start cutting back on articulation. But it does give it a very significant stance. Niek: That’s just what I was about to say. A super robots is the ultimate power fantasy, and the ‘A’ stance is key for a robot like this. In the process I had a lot of conversations with other designers who like robots, to talk about what important things I had to get right, and found that the ‘A’ stance is very important. And I think people are going to enjoy the way I achieved it, even if it’s not an articulated joint, it’s a very crazy angled build, because it’s not a standard System angle – it’s a kind of floating triangle within the square that is his hip. It’s one of my favourite parts to build, because it’s so weird and unexpected. I’m not into Voltron, but for me, there are still a couple of specific things that stand out. One is the fact that this is one big model, and at the same time stand-alone smaller models, which is of course, I understand, the concept of Voltron. But how much of a challenge is it to get both parts as recognisable as possible? Niek: It’s very much a give-and-take thing, where you want to make it look as good as possible in the robot form, but you also want to make it look as good as possible in the lion form. And it needs to actually work. Niek: And hold together. Which meant I had to play with the proportions a little bit, play with specific details, and in the end, basically you have to pick one form that you’re going to favour. In this case, we favoured the Voltron form, because it’s such a prominent thing and so unlike anything we’ve ever done before. So the individual lions have some things that had to give, to make sure that the final one looked better. The good thing about the individual lions is that they’re much lighter than the complete Voltron model, so they have a lot more articulation, a fair chunk of the articulation of the original fan submission. And that was very important for me. 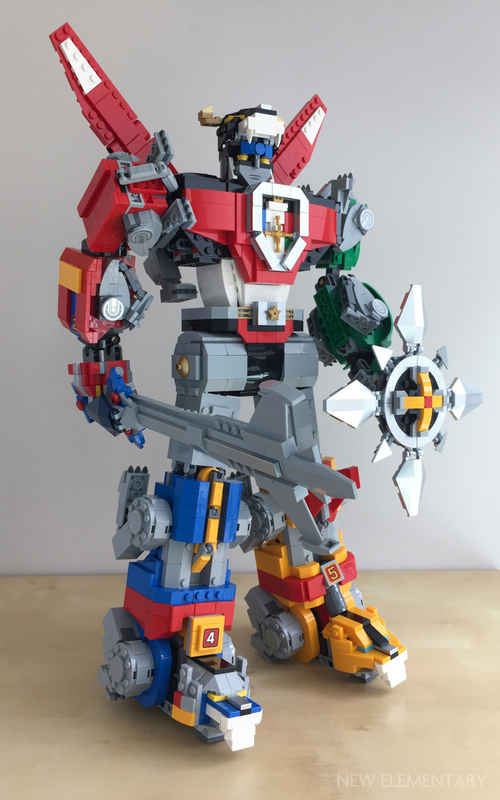 One of the options that were on the table at one point was making the whole thing smaller, and I was personally against that – it had to be big because of the original submission – and another one was simply having no transformation, just make it a solid Voltron model. But in that case we wouldn’t be able to do the main thing that Voltron is known for: forming Voltron. So from a play point of view, and from a collector point of view – my point of view! – I knew I wanted to have this transform. The other thing that I would say stands out is the design of the box, which is really big and very early ‘80s, and unlike anything I’ve ever seen from LEGO. Niek: With all LEGO Ideas products we try to spice up the packaging to make it stand out. Because it is kind of an exclusive product, we want to really take it all the way and make it crazy. The same thing goes for the building instructions. We split them up into six books; one for building the shield and the sword and the transformation, and the other five books are for building the individual lions – they’re actually individually bagged as well. 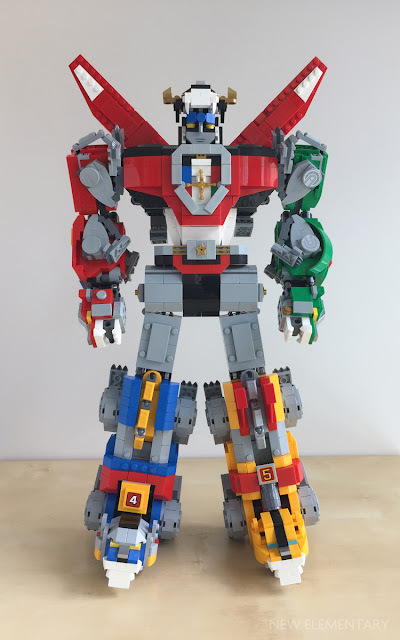 So if people have a big group of friends that they want to build Voltron with, everybody can build their own lion and they can build it together. 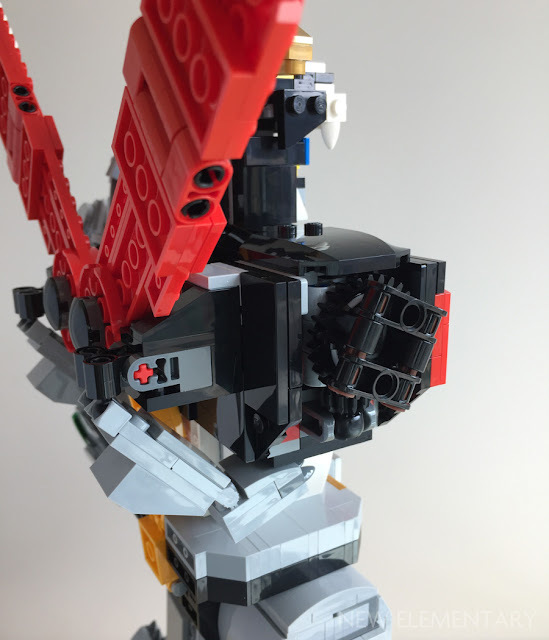 I of course realise that most LEGO fans will not be very interested in sharing their toys, so it might be a dumb selling point, but for me personally, I think it really fits with the whole Voltron theme of teamwork. It’s a cute detail that we really wanted to capture. And it’s a huge set. 2311 pieces. Niek: Which is funny, because the set number is 21311. You like to play with numbers, don’t you? Niek: We do. And the one thing I contributed to the Saturn V rocket… Carl Merriam and Mike Psiaki are kind of my mentors – they were managers and I was their protégé. I was working with Carl while he was doing some work on the rocket, and the 1969 parts count was actually my idea. 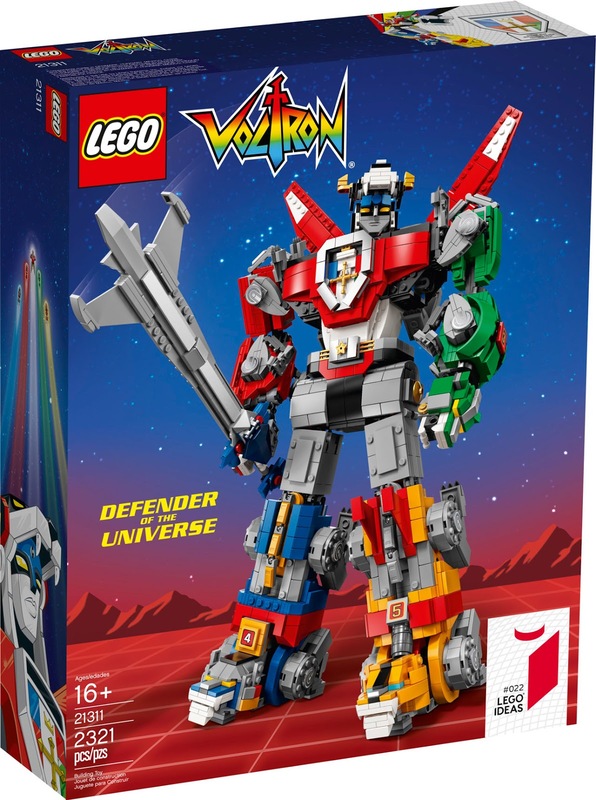 21311 Voltron has 2321 pieces and is available to VIPs on 23 July 2018. General release is 1 August, priced £159.99 / US$179.99 / 179.99€. 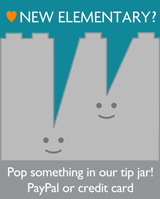 Help New Elementary carry on publishing articles like this. You can send an amount of your choosing via PayPal or card by click the image on the right. Think of it as the price of an app, or a book, or a yearly magazine subscription – whatever we're worth to you, we'd be honoured to receive it. A lot of official lego mech sets don't have very good articulations. Leave it to the moc guys to do it. Yes, they’re under fewer restrictions!